Dwelvers Forum › Community › Introductions › Hello Dwelvers! I plan on creating some other threads, but before I post suggestions or anything critical I wanted to get this out of my system and in my first post. I am so happy to see this genre coming back. I loved the DK series (well, the first one anyway) and this game is already pretty dang good even with the few bugs. Bugs? It's Alpha, they're features! About me: I'm a daddy of two (14 and 11) who last night abandoned his family movie night to play Dwelvers for 6 hours straight. I've been playing RPG and strategy games since Eamon was new. Rasmus, thanks for all the work you do responding to so many of the threads. It is nice to see a (the) person connected to development having actual conversations and not corporately approved transcripts delivered to vassals. Oh yeah, thanks for all the work on Dwelvers too. Well without people we couldn't went so far as we're now. Hope your family understand why they've been "abandoned"
I know I already said welcome to you elsewhere, but what the hell, welcome here too, Rikas Khan! What can I say? We're a welcoming bunch here! I'm looking forward to seeing what bugs you uncover that have eluded the rest of us so far, and seeing what ideas you have to improve Dwelvers. Welcome to the forum, i'm 17 years old and played the DK series as one of my first games, so i know that series far too well. Well, I guess I am missing another movie night or dos. Challenge accepted! hahahaha, but niether of you will beat my gold record! 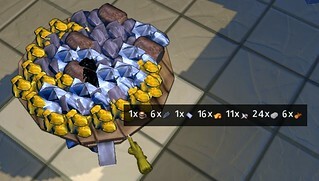 and 1 gold is worth 1000 fish, so says Rasmus! Hey RK. Been sick for a bit, so a lil late on the welcome. If it wasn't for saved games, I would have lost more sleep than I'd like on this game. See why I suggested that one Rasman? Glad to see a new face spending hours on Dwelvers. With all this interest in fishing, it seems to me you could make a fishing game out of a similar engine to Dwelvers. I wonder if anyone would be interested in a business sim built around the fishing industry, either the modern or some ancient version, ideas for future games perhaps? I love fishing games. One of the dumb things I keep from my friends. I don't find things like that dumb. It's just personal taste. One of my favorites way back in the day was a game called Utopia for my long defunct Intellivision, which had fishing in it, that was one of my favorite parts of that game, chasing down the schools of fish with my fishing boat to catch fish and make money, while avoiding the pirates and hurricanes that would sink my fishing boat. Such a simple old game, yet I got hours and hours of fun out of it. Current time: 20-04-2019, 06:16 AM Powered By MyBB, © 2002-2019 MyBB Group.